The four teenagers, who initially called themselves 'Feedback', rehearsed in Larry's Dublin kitchen, Bono on vocals, The Edge on guitar, Adam Clayton and Larry making up the rhythm section of bass and drums. 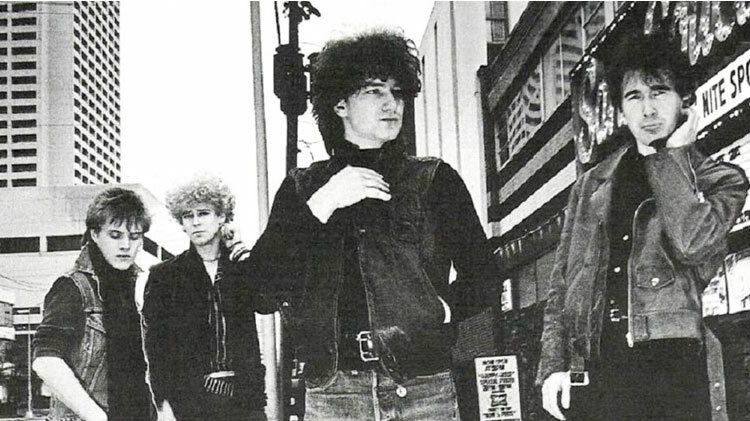 Inspired by punk, but insulated from the standoffish cool by the Irish Sea, Feedback had become 'The Hype' and then 'U2' and were soon building a local reputation based on the passion of their performances. "This odd group of people convened in my kitchen in artane. And that's where it started." U2's first single, 11 O'Clock Tick-Tock, was released in May 1980. Boy, their debut album, was released five months later - promoted by another single, I Will Follow , October, a year later and by May 1983, they had their first UK number 1 album with War, culmination of a trio of albums produced by Steve Lillywhite. Three years before the band had played support to Thin Lizzy at the annual Slane outdoor show. Seventeen years later, now established as the pre-eminent live act in rock'n'roll, they would return to play two sell-out shows themselves, later released on a live DVD, U2 Go Home'. They didn't realize it at the time but it was a set that would alert a whole new audience to their music but it was another two years before the band released, The Joshua Tree in 1987, the original working title of which was 'The Two Americas'. If the constant touring had seen the US hypnotise U2, America was about to return the compliment - the singles With Or Without You and the gospel-flavoured I Still Haven't Found What I'm Looking For, went to the very top of the US singles chart. The Joshua Tree went on to sell more than 20 million copies and at the 1987 Grammy Awards, won the band 'Album Of The Year' and 'Best Rock Performance', the first of what has become a record-breaking run of Grammy wins. In 2007 a remastered version of the album was released to mark the 20th anniversary of its original release and in their book, 'U2byU2' the band talked in detail about how many of the songs came together. At the 1987 Grammy Awards, U2 won Album Of The Year and Best Rock Performance for The Joshua Tree, their first Grammy Award wins. When Time Magazine put the band on its cover with the headline "Rock's Hottest Ticket", it was only the fourth time a band had made it to the cover - following The Beatles, The Band and The Who. They did too, going away to Hansa Studios in Berlin with Brian Eno and Daniel Lanois and dreaming up an album called Achtung Baby which took their music in a whole new direction. Band and production team had clashed over the direction they should be taking but out of this turmoil came one of their most acclaimed albums ever. As Daniel Lanois put it, 'If you manage to get the four of them in one room with instruments in their hands you're going to get results. That has a lot to do with my job - just getting them in the room and playing.' With The Fly, Mysterious Ways, and One U2 began the nineties with a new sound, a new reputation on the dancefloor and a series of their biggest hits. "If you manage to get the four of them in one room with instruments in their hands you're going to get results. That has a lot to do with my job - just getting them in the room and playing." The subsequent Zoo TV tour opened in Florida on February 29 1992 and circumnavigated the globe twice in almost two years before ending in Japan on December 10 1993. Achtung Baby had proved a groundbreaking album and production designer Willie Williams set about reinventing the rock tour with help from a 130-foot video wall juxtaposing 24-hour hard news, shopping channel ephemera and postmodern slogans to ramp up the irony levels. ("EVERYTHING YOU KNOW IS WRONG"). Guest appearances featured Lou Reed, Salman Rushdie (while in hiding in the aftermath of publication of The Satanic Verses) and Benny Andersson and Bjorn Ulvaeus of ABBA, who performed 'Dancing Queen' with the band. Still can't imagine what it looked like ? This is what it looked like. It being the run up to the 1992 American Presidential Election, Bono interrupted the set list to make satellite calls to the Bush White House. He never did get through to then President George Bush - little did anyone know that within a few years Presidents and politicians would be taking those calls - but via the ZOO TV satellite link he also called into war-torn Sarajevo, hearing the voices of a city under siege thanks to the maverick journalist Bill Carter.
' Zoo TV Live From Sydney'. The resulting tour, POPMART - which saw the band become the first major act to perform in Sarajevo after the Bosnian War - was another visual spectacle imagined by Willie Williams introduced the rave-rock of Mofo and Discotheque to a new generation of fans. And then there was Live 8, beamed live to half the planet, and opening up with U2 performing Sgt Pepper's Lonely Hearts Club Band with Paul McCartney. 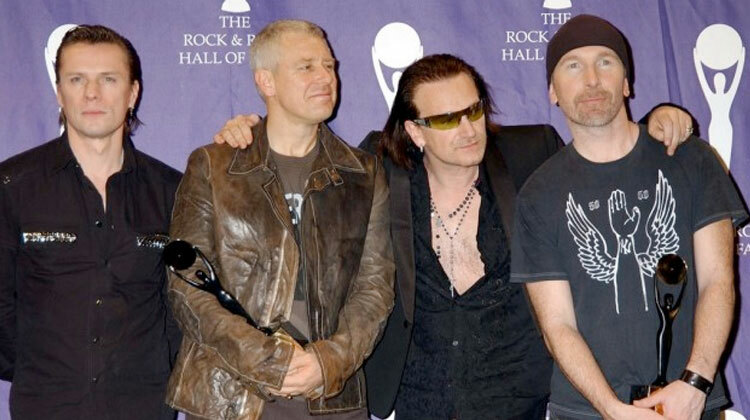 At the 2006 Grammy ceremony, U2 took home 5 Awards, including the coveted Album of the Year for HTDAAB. These new wins brought their total number of Grammy Awards to 22, more than any other band. in 2006 which also featured the new song 'Windows In the Skies' . Five years after the release of How To Dismantle An Atomic Bomb, in March 2009 the band released No Line on the Horizon. Their 12th studio album was written and recorded in in Fez, Morocco, Dublin, Ireland, New York and Olympic Studios in London. The album calls on the production talents of long-time collaborators Brian Eno and Danny Lanois, with additional production by Steve Lillywhite. 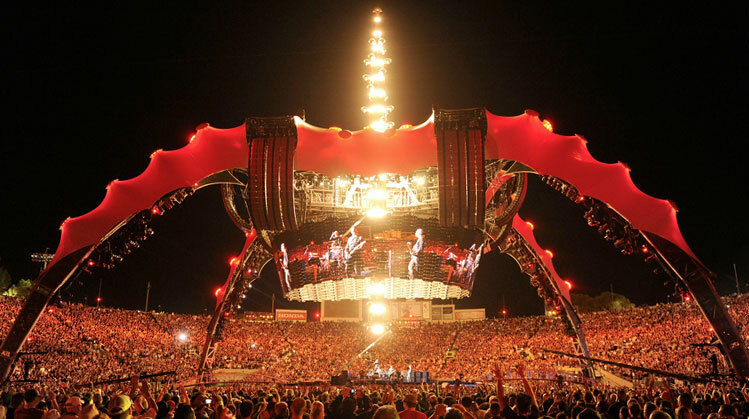 In July 2011, two years after opening up in Barcelona, the band played the final show of U2360°. Over 26 months it became the most succesful concert tour of all time, with 110 shows to 7.1million fans in 30 countries on 5 continents. Just a few weeks from the end of the tour, the band flew out of the US, back across the Atlantic and landed on a farm in the heart of rural Somerset. After all these years it was time to headline the Glastonbury Festival. OK, it rained, but that didn't stop the band setting the Festival alight - 19 songs from eight albums in an electrifying set over an hour and three quarters. Here's what they played - and what people said about a night to remember. Some other U2360° facts: 10 million watched a live stream of U2360° at the RoseBowl on YouTube; 320,000 Fans saw 360° in Mexico City ; 7,100 miles - approximate distance travelled by space station while talking with U2; 5,200 Years - collective touring experience of U2 tour personnel ; 400 tons - weight of the fully loaded claw; 134 Crew Members ; 126 Truck Drivers; 53 gigs attended by a single fan; 33 Flemish Speaking Crew members; 11 Babies Born To Crew ; 7 Astronauts Attended; 4 Appreciative Irishmen; 1 Singer in Surgery; 1 World Leader Released From House Arrest During Tour. In October 2013, the band revealed they'd written a new song, 'Ordinary Love', for the biopic Mandela: Long Walk To Freedom, starring Idris Elba and Naomie Harris. Produced by Danger Mouse, the song was released in a 10-inch vinyl pressing to mark Record Store Day on November 29th and the single sleeve featured a painting of Nelson Mandela by Irish artist and illustrator Oliver Jeffers. Oliver, along with Mac Premo, directed a lyric video for Ordinary Love. 'We thought it should be a love song, a very human song. ' Edge explained, when asked about how the band approached the request by movie producer Harvey Weinstein to write a song for the movie. 'Not epic, not earnest in dealing with world-changing political shifts but personal in two people trying to hold on to one another in the face of dreadful mistreatment and heartbreak.' The song went on to win the golden Globe Award for Best Original Song in January 2014 and was nominated for an Oscar at the ceremony in February, where the band performed it live. In February 2014, the band released another single, 'Invisible'. Produced by Danger Mouse and mixed by Tom Elmhirst, Invisible marked the launch of a partnership with (RED) and Bank Of America in the campaign to create an AIDS free generation. For 36 hours, every time the track was downloaded from iTunes, the Bank made a donation of $1 to (RED) for the Global Fund To Fight AIDS, Tuberculosis and Malaria. More than $3m was raised and when the track went on sale, all proceeds from 'Invisible' on iTunes continued to go to (RED) for the Global Fund. The video for 'Invisible', directed by Mark Romanek, was shot in black and white, in a Santa Monica airport hangar, over three days in January. With a cast of 1200. And flashlights. A sixty second clip premiered on February 2nd during the Super Bowl, to launch the partnership with (RED). Hailed by critics as a great work of art, Songs Of Innocence was attacked by some for the means of distribution.The band faced critics down: 'It's the job of art to be divisive.' They talked about the groundbreaking release in a video on Facebook. A month later, Songs Of Innocence was released on CD & Vinyl, the striking cover art featuring Larry Mullen Jr protecting his 18 year old son. The image resonated with the band's iconic 1980 debut album Boy and, three years later, the War album. Both featured the face of a child, Peter Rowen, the younger brother of Guggi, Bono's childhood friend growing up on Cedarwood Road. In May 2015, the iNNOCENCE & eXPERIENCE TOUR opened in Vancouver, the first of seventy six shows, as the band took the new album on the road across North America and Europe. Opening with 'The Miracle (Of Joey Ramone)' and closing with 'I Still Haven’t Found What I’m Looking For', the show was to feature up to eight tracks from the new album. USA Today reported it like this: "A blistering start and finish book-ended a tech-tinged show that is bombastic, brilliantly absurd arena rock". #U2TheJoshuaTree2017 was performed against (a) video backdrop, often with starkly beautiful desert scenes by Anton Corbijn, the photographer for The Joshua Tree album cover and many other U2 graphics. The band was dwarfed, but the music wasn’t. 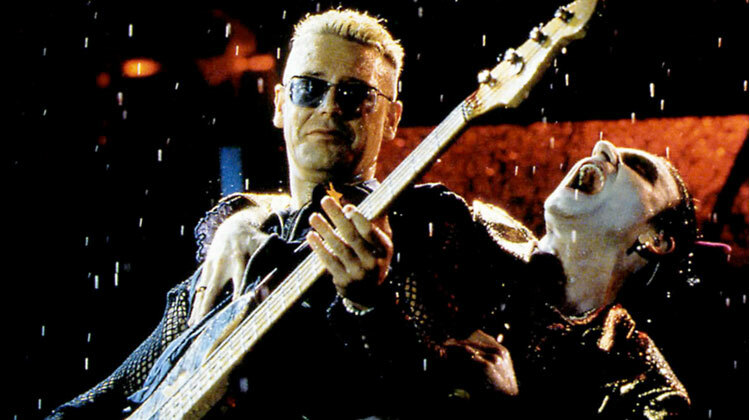 Larry Mullen Jr. on drums, Adam Clayton on bass and the Edge on guitar tore into the urgent rhythmic flux of “Where the Streets Have No Name.” Against the craggy postpunk groove of “Bullet the Blue Sky,” both Bono’s falsetto and the Edge’s guitar leads were keening sirens. In May 2018 the band hit the road again, third year of touring in four, this time with the #U2eiTour and playing tracks from the new long player: 'The idea for this tour,’ explained Adam, ‘is to finish telling the story of innocence and experience…’ First song on the opening night in Tulsa Oklahoma was Love Is All We Have Left, with the closing track 13 (There Is A Light) and the opening night reviews were good. There was a special guest everynight, back from the dead, or at least from the 1990’s.